est to explore the program in sections over the next few blogs to give readers some ideas that they can use while raising their own puppies. This month I would like to focus on PLAY. Play is a central part of my program. Play teaches a puppy all about dog language, about their body, how to think on their feet, to be tolerant, to be patient, and also to master the rules of engagement. All of this is an important part of shaping and developing the personality and potential of your puppy, but it must be done in a thoughtful and controlled manner to be effective. One of the first things I added to the puppy play area was a wide variety of obstacles, textures, and visuals for the pups to get a taste of many things the world has to offer. We know from research that puppy brains expand with all the new things they experience during the first couple of months after birth. 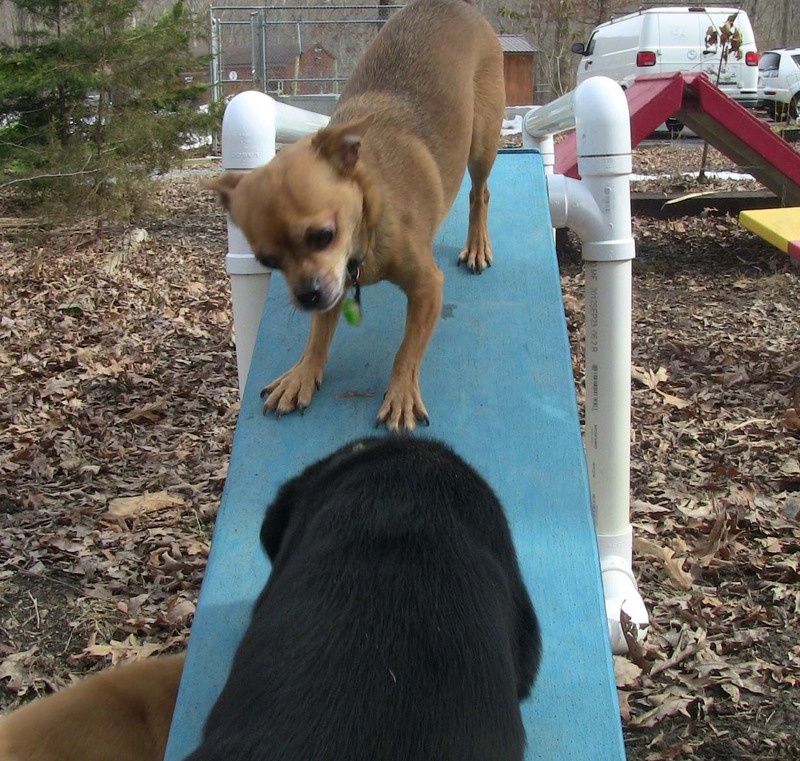 Starting at 5 weeks, I bring the pups to the play area and encourage them to walk over all the surfaces we have there. They include bricks, gravel, bark mulch, dry leaves, sand, cement, plastic, and fabrics of various kinds, to name a few. The list has endless possibilities depending on what you have available to include. 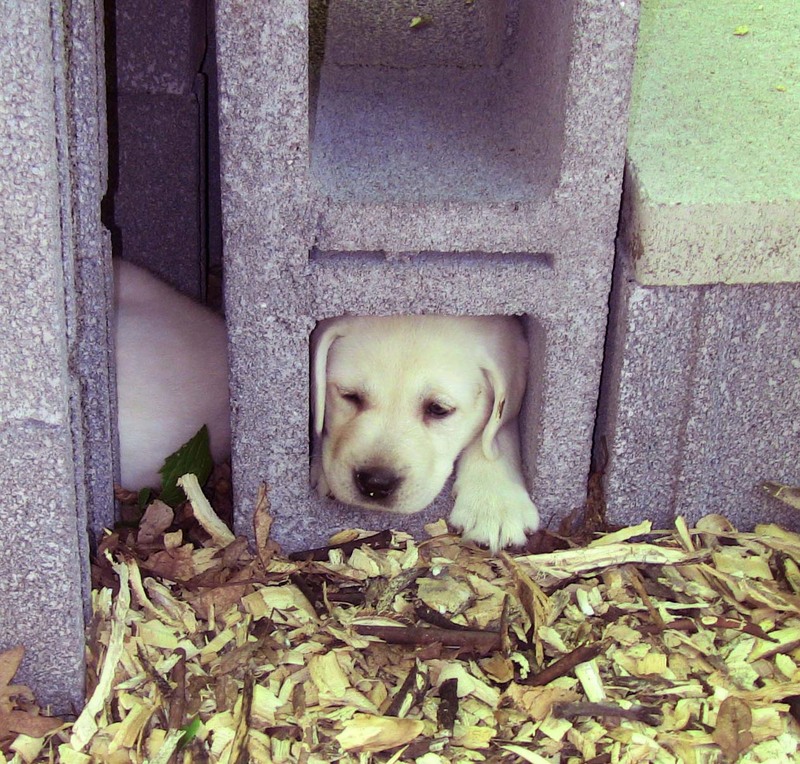 There are also many different things for the pups to climb over or crawl under. You never know what will strike their fancy on any given outing and I have often been surprised at the places I have found them. One obstacle that takes most pups several weeks to master is a deliberately off level tunnel arrangement that teaches how to walk on non level surface with different visuals and egress at either end. I can see big difference in breeds and bloodlines on how the pups handle this one. It appears simple to the human mind but is truly challenging to the puppy in learning mode. these skills. He is very patient and loves to work with the young pups that are about his size. I’m always nearby to make sure no one gets hurt but allow them to slip off a ramp up or down if its not too far from the ground as part of the learning experience. As the pups get older and I take them through more of the formal obedience I will continue to teach exercise so they learn to be more aware of their legs. This will help them feel comfortable getting into tight spaces, climbing but also keep them safe while being active. The more formal training is done with FitPaws™ products and is something I learned from studying Dr. Chris Zink’s work on canine fitness. It has been a real positive since I have added this element to the program. By 8 weeks of age, all the pups here have a good command of the obstacles and items in the play area. It is now time to introduce the pups to the older dogs and expand the pack dynamics beyond mom and littermates. As a breeder, I have access to my own pack, which makes this part easy. I know the dogs in my pack and know how they act with puppies. More importantly, I know they are not going to teach the pups any undesirable habits. If you don’t have your own pack or know a breeder who will allow you to run your puppy with their pack, then it might be a challenge to find a group of dogs that would be suitable. The key to this step is getting the right group of dogs together. 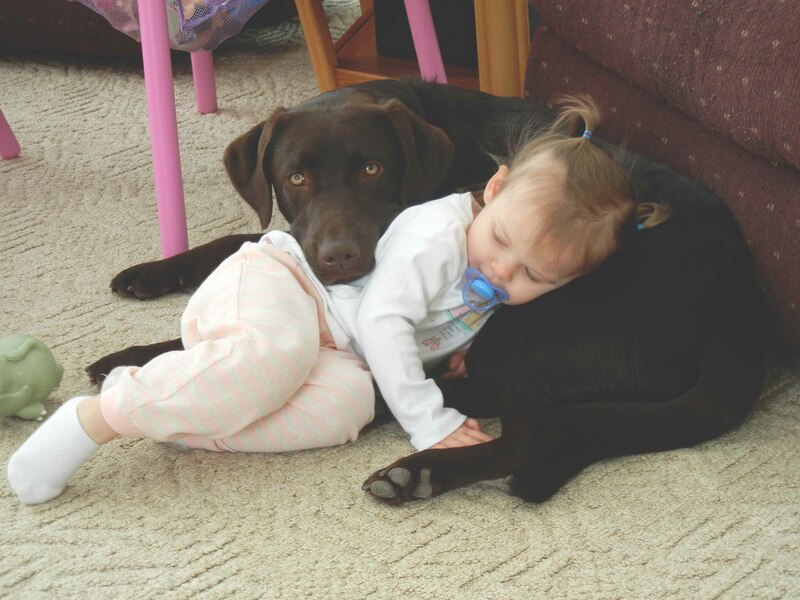 Dogs with bad habits, even small bad habits, will influence the puppy in a negative way. When the pups are introduced to the pack you want them to learn how to play politely with other dogs, to play quietly, to share toys and not show signs of resource guarding—all important things that will make for a better canine citizen. 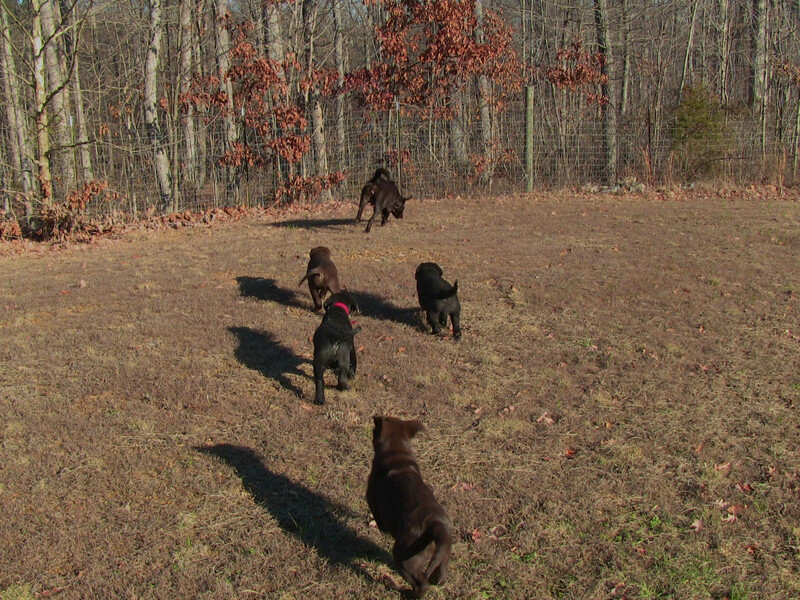 With the right “teaching” dogs in the pack, the pups will learn how and when to engage in play as the older dogs patiently teach the pups the rules. It’s fascinating to watch them learn too. Again all this builds character, so don’t interfere much here. Let the dogs do the teaching while you take notes. From my notes on this activity, I will structure the training exercises for the future lessons. If a pup is not very patient or not showing good self-control, then I will use games designed to enhance this skill as we move on with the formal obedience. You can also see learning patterns with the pups during these times as well which can help you choose how to set your pup for success during obedience lessons. If your pup is very visual then you should have training exercises that make allowance for that trait. One last way in which I also use play when raising the pups is as a stress reliever when the situation calls for it. If you are teaching the puppy something that is very stressful or causes some anxiety, to interject a brief play time can help turn a potentially negative experience into a positive one for your puppy. When I am testing pups during obedience training around increasingly higher distractions, I will often see signs of stress as they are trying to do the right thing in face of something else they want to do more. So after they successfully complete the exercise I will break off into a brief play session to not just reinforce the reward and praise for a good job but to relieve the tension. When stress levels are high, learning is low and retention of the lesson is not as good. This is something to keep in mind as you move on with your pups training. Be carful not to overdo this type of play as the smart pup will soon be running the show, manipulating the situation to their advantage. Play has its place in the raising of a well-balanced puppy if it is done properly, safely, and for all the right reasons. Remember that good play stimulates the brain, offers positive learning experiences that will help the pup relate to other things in their future, and it strengthens the body too. For those who follow the Chilbrook Labradors on Facebook you know that this month my litter of puppies from Gillie and Cookie has turn 8 weeks old. At this age they are starting to leave for their new homes which means it is time for me to decide which ones from the litter will be sorted out to be the next generation of service dogs. I am often asked how do you decide which ones to pick? I have 5 general guidelines when picking a purebred puppy for the medical alert service dog work that I would like to share with you. Some of this applies to adult dogs and even rescues but I am focusing in this blog on the pups. How many of the dogs in the pedigree have produced working service dog offspring? How many dogs in the pedigree have some sort of performance title or have been tested and certified for some other job? The more dogs you see in the pedigree that have produced pups that have qualified as service dogs at some capacity, the better. 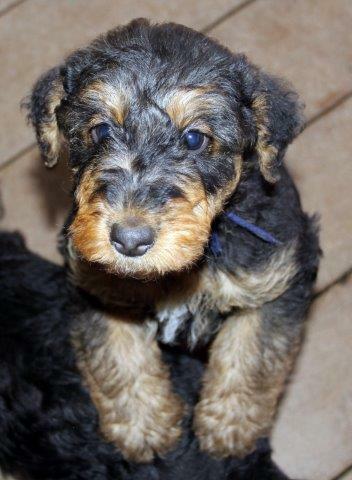 It goes without saying that the more complete the health clearances on the relatives in the pedigree the better chance that a pup from the litter will be healthy. The next thing I want to do is get the pups out into an area that they know and just watch them interact. 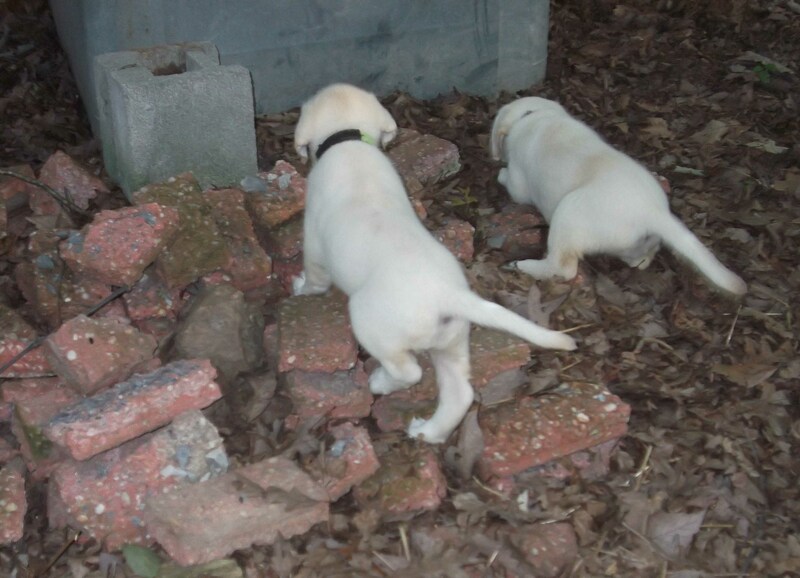 The more distractions, obstacles, and things that the puppies can interact with the better you will be able to see something about their character. Here is a short video of the litter interacting with their environment. When I am looking at pups in this situation I want to see who instigates the charge into a new area, who is confident-clumsy-careful on new surfaces, obstacles or around new people or dogs present. How are they interacting with the things they find? Do they give it a once over and walk away? Or do they stay and engage, exploring all the angles of whatever they have encountered. How many times does it take to learn a new behavior? If they fall or have a negative experience what do they do? I want a pup that is bold but not too bold, confident but not a bully, one that is a thinker and is not satisfied until they have learned everything about a new encounter, and one that is not too sensitive-who recovers well from anything that happens. The third area I look at is how those same pups act now in a totally new environment. I will look for all the same things and compare to my notes from the previous area. Consistency of character speaks volumes to me and rarely do I find that a pup that is the same in all the testing situations will ever fail me in training. Once I have done the above with the litter, I will bring the pups inside one at a time to a small area, preferably one they don’t know. Before the pup comes in, I will put out a smelly container of canned cat food someplace in the area where it is not too obvious. It is best if you can put it under a plastic milk crate or something similar. I bring the pup in, put it down, and say nothing. What I am looking for is the pup that once it gets its bearings, the nose starts and it just has to track down that tempting smell. The pup that does not stop until it finds it and then persists at trying to figure out how to get the food out from under the crate gets high marks here. The final test is what I call the snuggle test. We are all finished and it is just me and the pup, do they come and snuggle with me and settle down for a nap in my lap or beside me, or do they go off someplace away from me to do so? How does the pup look at me, what does the pup do to get my attention? A puppy that sits and looks at me in a thoughtful way, interacts by snuggling when I talk to them will get high marks from me in this area. Medical alert dogs are such a part of someone’s life they have to have that connection with people from the start to make the best results from the training. Sure, training and feeding a dog will help it bond with you but if the pup is connected to people strongly from the beginning before any training you are just that much further ahead. You can always pick out a headstrong independent dog with this little test and if nothing else, just being able to avoid a dog like that makes the test worth doing.